Gandini Juggling join Worthing's Summer of Circus! 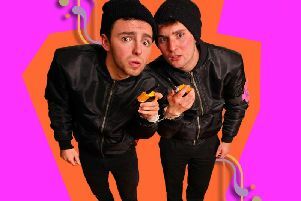 Classic rock ‘n’ roll becomes the soundtrack for a juggling extravaganza as part of Worthing Theatres’ Summer of Circus. 8 Songs, from Gandini Juggling, comes billed as a tribute to the mythical landscape of popular music. It plays Worthing’s Pavilion Theatre on Friday, June 22 at 8pm. From Dylan’s stream of consciousness to the Velvet Underground’s troubling landscapes, from David Bowie’s soulful escapades to the rocking Rolling Stones’ greatest anthem, each song has its own atmosphere and its own micro universe, promises company founder Sean Gandini. Creating a sense of ritual, celebration, and primal tribal energy, the piece builds crescendo0style from solos and duets to a full-cast finale. The Stones song Sean has chosen is Sympathy for the Devil: “What is so interesting is that these are eight songs that I would never tire of listening to again and again. There is only one of the eight songs that I don’t really feel that way about (Good Vibrations by the Beach Boys). “But with Sympathy for the Devil, every time it starts I feel the same elation. It is an extraordinary track. Each has a ghost version where we take the music away and just deal with the lyrics. And I think Sympathy for the Devil is a revelation in terms of its lyrics. It is quite sinister. But with all of them, we have tried to go to a deeper layer and assume that the lyrics are pieces of poetry. We have got a Dylan in there as well, I Want You. We do Velvet Underground’s Sunday Morning and David Bowie’s Scary Monsters and Janis Joplin’s Summertime… and then we do a Schubert track which is a kind of rock ‘n’ roll! “Good Vibrations is maybe the one I enjoy least, but I do enjoy it. I don’t think Good Vibrations really sits on the same shelf, but actually 8 Songs started life as an outdoor piece, and outdoors Good Vibrations was the track that everybody liked the most. “But the Stones are great. We did a performance at a stadium once just before they were on. That was at Wembley. We watched the show, and Mick is just such a fantastic performer.